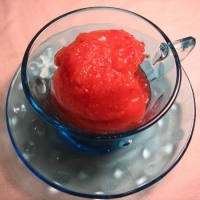 In a blender, puree the strawberries with the cold water. You may then strain to remove seeds, but I like the seeds and actually left my puree a little chunky. In a bowl, combine the puree with the lemon juice and vodka, then stir in the sugar until entirely dissolved. Cover mixture and refrigerate until quite cold. Pour chilled mixture into ice cream maker and follow directions for your particular ice cream maker. Cook's Illustrated says "Scoop frozen sorbet into a container. Seal and transfer container to freezer for several hours to allow sorbet to firm up. (Sorbet can be kept frozen for up to 3 days.)" NOTE: This was a little too sweet for my tastes, but the high sugar content is part of the chemistry of the freezing process and part of the great smooth texture. I will continue to experiment with how little sugar is necessary for the great texture, and amend this recipe if I get new data! Please post a comment if you end up trying with less sugar (but still using the vodka) and let us know how it turns out. This way great! My strawberries were really ripe when I made this so I cut the sugar in half because the berries were ripe enough. Definitely a redo! The sugar content of your fruit can vary. A taste can help you adjust additional sugar. Some alcohal and a touch of citrus can make the flavors pop. I think this sounds scrumptious! I don't have an ice-cream maker but could probably make it into a slush type thing? Just got my Ice-cream maker as a gift, so will definite try this out! Thanks lot! I have a Donvier 1-quart ice cream maker. I think it was around $45, but that was more than ten years ago. It was a terrific investment. Even if I only use it a few times a year, the sheer fun value makes the purchase worthwhile! My boyfriend and I are going to going to try to make our own Rice Cream (non soy, non dairy...). I'll post a recipe here if we are successful! Oh this is the perfect excuse for me to get an ice cream maker lol. Not being able to eat dairy I'm always on the lookout for stuff like this! Thanks! Like scrumptious's recipes? Never miss an upload!